Upon the passing of basketball icon Dean Smith Sunday morning, I have been reflecting on the impact that athletic coaches (specifically basketball coaches) have had on my own practice. While what I do for a living is “a totally different ballgame” than theirs, I noticed that I have pulled something from each of these leaders that I aspire to apply to my own work in leading learning. Coach Hardiman was the first coach I ever played for. As a 12-year old first trying out organized basketball, I lucked out into being drafted on his team. We were the Rams that year, and we won the championship of the league. Being that it was literally my first time playing “real” basketball, I spent most of the time watching (though I did get to play a fair amount). In watching that year, I noticed that our team was uniquely different than that of our competitors. While our team was talented, no one player on our “starting five” was necessarily the best player on the court. Each, however, had the perfect skills to fit their role in what I later found out was a modified version of the Triangle Offense (which I have since learned a lot about from #2 on my list). All five of those players were on the league’s All-Star team that year, predominantly because of the WE BEFORE ME approach that Coach Hardiman instilled in us. My role was relatively specific on that team. I could hit a pretty consistent jump shot from the corner, so Coach put me at our baseline forward position on offense. His suggestion? “If you get the ball here, and you’re open, square up and shoot it. You’ll knock it down, and it’ll be the best shot for us to score. Otherwise, keep moving the ball to swing the defense.” His confidence in me made me feel comfortable in playing the role that our team needed me to play. Defensively, I played a forward in our 2-3 zone, charged first and foremost with the job of getting myself between the basket and my opponents every time a shot went up. Rebounding position was really important to Coach Hardiman- there was nothing less defensible than letting someone else beat you to the spot on the floor most likely to hold the other team to one shot. Over the years, I played on three other teams under Coach Hardiman’s lead, eventually moving from that baseline forward position to a more versatile offside wing position. He saw me as a creative asset that could make the big baskets when our team needed it, so that’s what I became. While we made it deep in the playoffs every year and I made several All-Star teams of my own, it wasn’t necessarily that success that drove me and my teammates to come back every year: it was the way we felt when we were playing together. Coach Hardiman made us feel like anything was possible so long as we went after it together as a team. Like most young men my age, I was a huge fan of the Chicago Bulls. HUGE. To illustrate that fact, I’ll make a confession: for upwards of 5 years, I made it a personal mission to wear some piece of clothing that declared to the world my dedication to the team. Every day. For five years. By a kid living in Richmond, Virginia, 804 miles away from Midtown. At the time, I attributed my affiliation to the team to an appreciation of Michael Jordan, and for good reason: he was my first favorite basketball player. I had followed him since the moment when I first opened a pack of Fleer basketball cards, flipped through the deck, and said, “Michael Jordan…I’ve heard of him. Isn’t he good?” I then watched the next Bulls game on TV and decided, “Yes. He’s good. He’s REALLY good.” My dad tells me that my fandom began when I saw his first big moment: the open jumper from the left wing when he hit “The Shot” against Georgetown in the 1982 NCAA Championships, but I really don’t remember all of that. Of course, I was a huge fan of Jordan. What I learned years later was that I was actually a fan of Phil Jackson. I loved watching the Bulls play. Every nationally televised game was a holiday in my house, one where everyone knew what I would be doing. (I still remember when our cable provider offered WGN- I’m shocked that I ever made it out of the house after that time.) But it wasn’t just Jordan: it was the team. Like my own Rams teams, I used to love all of the different roles that each of the Bulls played on the team. As incredible as Jordan was on the court, it was guys like Cliff Levingston that I appreciated most. “Good News” would provide a spark to the team with his hustle and energy, always keeping the team in good spirits. Every player on those teams had that kind of voice, that kind of story. Every player had a role. Coach Jackson caused that WE BEFORE ME mentality with his approach to the game. He instilled a much more nuanced version of the Triangle Offense than Coach Hardiman had used, the similarities of which I did not notice until years later. Jordan used to call it an “equal opportunity” offense, one that kept every player in the flow of the game. While Jordan would often take over the reins as necessary (as one would expect the arguably greatest competitor in the history of the game might), some of the best moments in those historic runs took place when everyone on the team was involved (including this championship-winning three-pointer against the Suns in 1993, when all five players on the court touched the ball). Those Bulls went on to win 6 championships in 8 years, after which time the team went its separate ways. 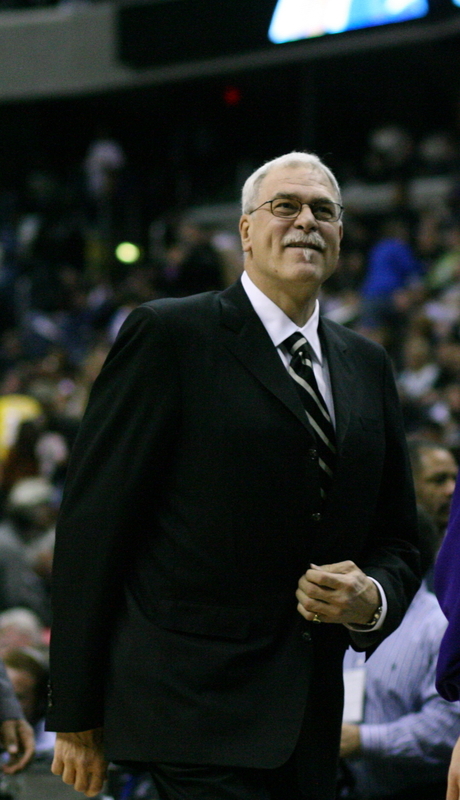 Phil Jackson made his way to Hollywood, leading the LA Lakers to 5 more championships and 7 NBA Finals in his 11 seasons with the team. I’ve since read several of Jackson’s books (my favorites being Sacred Hoops and Eleven Rings), and what I’ve learned about the Zen Master is how much he values knowing his players, knowing their strengths, and knowing how he can support them not just as basketball players, but as human beings. During my early years as a teacher, I joined the coaching staff of the JV girls basketball team in the school I worked under the tutelage of a neighboring Government teacher seeking a partner in her efforts. She knew I liked basketball, and she knew that I liked teaching, and so I guess she thought I’d fit right in. Over our three years together as a coaching staff, I no doubt learned a lot about the nuts and bolts of coaching a team from Coach Strong. She taught me a lot about situational offenses and full-court presses, about running practices and organizing plays in the huddle. But what I’ll carry with me the most was the time that we spent building individuals into a team. Our first year together, we were in a unique position where several students who would generally play JV had been called up to varsity. That meant that several of our players were having their own first opportunity with organized basketball as a part of our team. We won one game all year that season, and few times in life have I been as proud. The same went for Coach Strong- it was the only losing season in her career as a coach, and you would have never known it from the pride she exuded in each player’s growth. That team rallied together and pushed each other to improve, and each grew tremendously over the year as a result. They could have given up at any time, but Coach Strong never gave up on them, and they never gave up on each other. What I remember most about those years: we built deep relationships with these athletes, not just as players but as people. Coach Strong helped me to see the importance of getting to know the whole child, not just the student in the classroom of the one subject you happen to teach. These connections outside of the classroom led to significant connections inside the classroom, generating some of the most personally meaningful and inspirational stories of my educational career. Some coaches are able to discover threads that tie men together through different motivations, and for whatever reason, they simply work in the macro. Honesty and earnestness is a part of it with some people, and Bennett is one of those guys. He doesn’t do swift and pretty. His program projects reflect the way his teams play: slow, methodical, with purpose — and without arrogance or presumption. Cavaliers basketball is now based on five pillars: unity, thankfulness, praise, humility and servanthood. By the time the `Hoos took the court for practice…the latest polls were out, but there was no mention of the No. 2 ranking, and Bennett offered his players no extra praise. “There is an awful lot of Hoosier’s (as in Norman Dale and Jimmy Chitwood) in this UVA team–underdogs that come together and can defeat the so-called Goliaths of the sport using their 5 pillars of humility, passion, unity, servanthood, and thankfulness. It is not ugly basketball. It is a beautiful thing. What makes UVA Basketball so impressive? Slow, then quick, improvement. Tony Bennett has been there for six years. His record has improved every year – 15-16, 16-15, 22-10, 23-12, 30-7 and 28-1 (assuming they get to 30+ wins this year, which is a good bet). What makes UVA Basketball so impressive? Defense, defense, defense. Virginia plays a ferocious pack-line defense…at times, it looks like UVA is playing six to five. They smother. (Here’s a great breakdown.) Why is that a bad thing? It’s more exciting than what 99% of NCAA teams do offensively. Watching good defense is watching good basketball. What makes UVA Basketball so impressive? They’re blue collar, not blue chip. In the world of one-and-dones and John Calipari, UVA harkens back to the good ol’ days of college basketball. There are no one-and-dones. There are no McDonald’s All-Americans and no top NBA prospects. They’re as blue collar as a team playing in a state-of-the-art $131 million arena can be. UVA is what’s right with college basketball. Finally, I get to the man that inspired this post in the first place. Coach Smith’s place on this list shouldn’t be mistaken for not knowing who he was. I may have graduated a Wahoo, but I grew up a Tarheel. Some of it was my dad’s influence, some of it was Michael Jordan’s – as after watching Come Fly With Me surely close to a hundred times, it’d be hard not to have Coach Smith as a favorite coach. No, Coach Smith is this far down the list because until now I have not spent a lot of time learning about him. He is this far down the list as a reminder that I still have much to learn from him, even if he has since passed. What I know of him up to this point? He originated the Four Corners, which led to the adoption of the shot clock. He coached (almost) all of my favorite Tarheels, including Michael Jordan. He is famously credited with being the only person that could hold Jordan under 20 points per game. (Not even Father Time could do that, as Jordan did not have a single season in the NBA where he averaged less than 20 ppg, even with the Wizards.) He won a championship with that 1982 team, as well as another against Michigan and the Fab Five in the famed “Webber Called Time-Out!” game in 1993. He retired in 1997 with 879 wins, which at the time was the most in NCAA history. (He’s since been past by at least two others.) And he had an arena named after him: The Dean Dome, where I remember seeing a preseason game between the Bulls and Nets (which has its own story), as well as a regular season UNC game when I was visiting the university with a childhood friend. That’s pretty much it. My knowledge of Dean Smith in a nutshell. He is credited with the popularization of encouraging players who scored a basket to point to the teammate who passed them the ball, in honor of the passer’s selflessness. That’s so cool! Also attributed to him: the practice of getting players to huddle at the free throw line before a foul shot. Never missing an opportunity to help the team get on the same page. He instituted the practice of starting all his team’s seniors on the last home game of the season (“Senior Day”) as a way of honoring the contributions of the subs as well as the stars. That last factoid reminded me of “Big Blue,” a practice where Coach Smith would bring in five new players off the bench (often walk-ons as opposed to the scholarship players) whenever he felt like the team needed some energy. It wasn’t a punitive measure for the “regulars,” but a sign that he trusted all of his players to do what was needed. Someone posted Coach Smith’s recruitment letter of Michael Jordan, scanned into this story on FanSided. Such a small gesture, and yet such a huge one. What’s even bigger: this article from the Huffington Post laying out 15 inspiring stories that prove he was more than just Michael Jordan’s coach. Chief among them: Smith’s push for racial integration throughout his career, his support of civil rights in general, and his “one firm rule” that he would drop anything if any of his players ever needed to talk to him, no matter how important it seemed. I cannot wait to spend more time learning about the life and legacy of this man. What I noticed in reflecting on these coaches is that their impact on me ultimately has very little to do with basketball. It’s a given that I’m a big basketball fan, that each was a coach of one of my favorite teams, and each was an incredible basketball coach at his or her core. All that being said, while each has a firm grasp on the X’s and O’s of the game, that’s not why they come to mind. I’m not that kind of coach anymore. They resonate the most with me because they all placed an equally high value on their concern for people as they did on their concern for production. 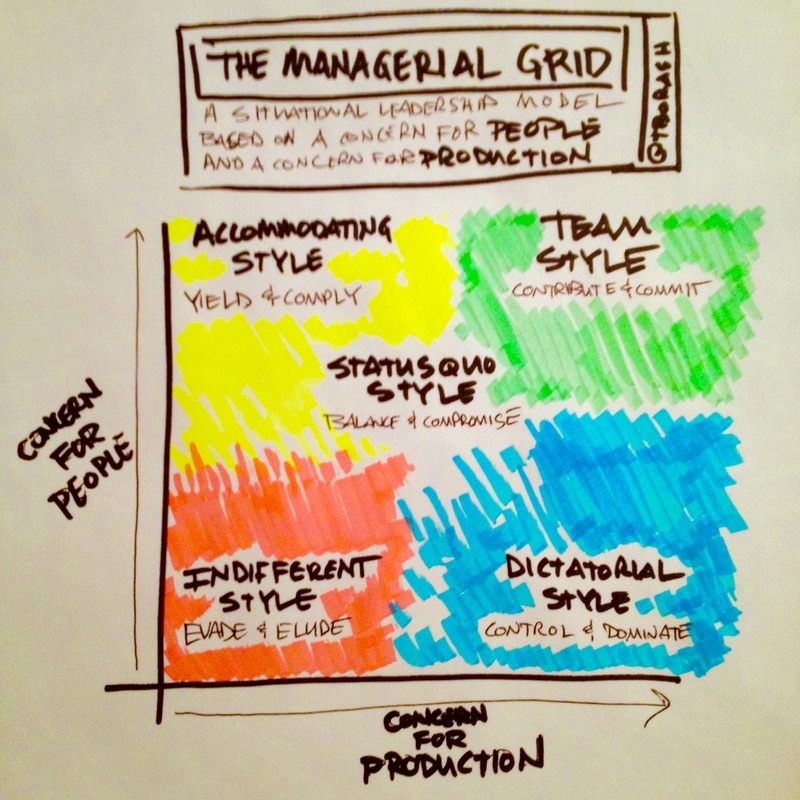 I first ran across this concept as a Managerial Grid model developed by Blake and Mouton back in the 1960s. While it’s gone through several phases in its life cycle, the essence remains true: the approach that gets people connected, committed, and contributing to a mission involves both a high concern for people as well as a high concern for production. It’s not enough to push for production and expect greatness to happen, just as it’s not enough to care about people and expect anything more than sunshine and rainbows. Effective leaders must do both. And not both in an alternating fashion (which is described as a Paternalistic Style)- they must show high concern for both production and for people at the same time. Help those I serve find where they fit, and vocalize the trust I have in them to succeed, just as Coach Hardiman did for me when I was just learning how to play. Remember that “The road to freedom is a beautiful system,” as Coach Jackson once said in his Mindful Leadership practices. Help people identify clear structures within which they can work together seamlessly, which will allow their individual greatness to blossom to more than the sum of its parts. Get to know people not as students, teachers, and administrators, but as people, as Coach Strong inspired me to do. Listen for those passions that make people’s eyes light up, and connect with them in order to learn from them. Embody into everyday practice the five pillars that Coach Bennett has instilled: unity, thankfulness, praise, humility, and servanthood. Last week, my teammate used similar language: “The tension between unconscious competence and conscious competence? That’s humility.” Definitely something to reflect on. 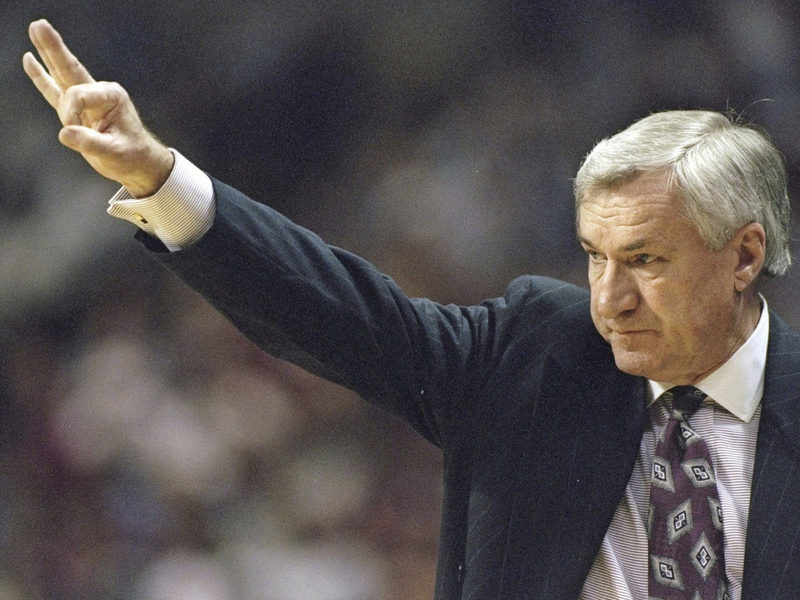 Point to thank those who “pass the ball” such that it leads to success, as Coach Smith encouraged his players to do. Celebrate the selflessness of the team, and contribute to it by looking to pass to those who have the best shot available. Commit to the mission, commit to the team, and contribute every day. PS Closing with that Rudyard Kipling quote felt just about right, until I realized that it indirectly sings the praises of crosstown rival NC State. No matter, it’s just a little too good to pass up. RIP Coach Smith. Thanks for the memories, both old, new, and yet to be.